Alterra Extreme Volume Mascara in 01 Black is another item from my Germany Beauty Haul. 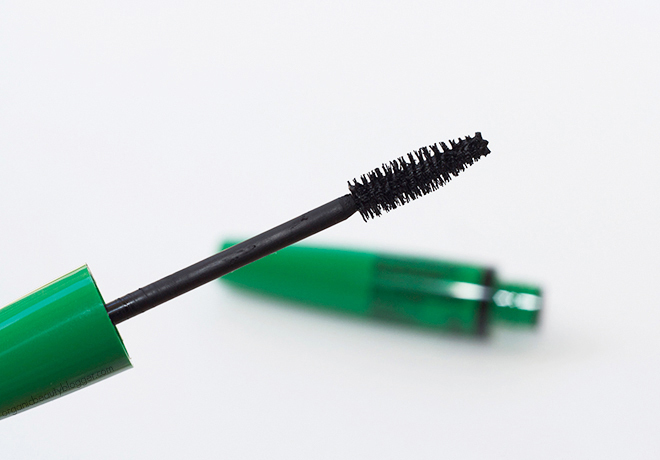 The packaging of this mascara is a simple green mascara tube with an ordinary, medium size and density, brush. The mascara is comfortable to use without staining eyelids or under-eye area. But… yes, here comes a big, fat “but”. 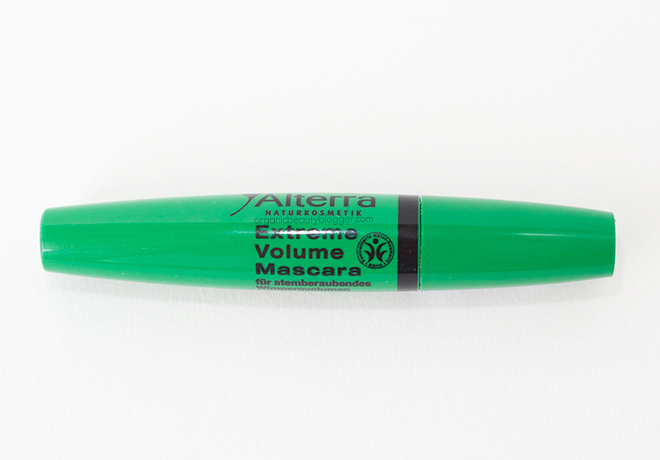 I don’t like the saying “you get what you pay for”, but this is exactly the case with this Alterra Extreme Volume Mascara (it retails for about 4 EUR for 9 ml tube). I can give it credit for nicely separating the lashes, but that’s it. If you like natural looking lashes with almost no volume and curl, then you might like the effect this mascara gives, but don’t expect anything too dramatic from it. Aqua (Water), Alcohol*, Magnesium Silicate, Ricinus Communis (Castor) Seed Oil, Stearic Acid, Sorbitol, Prunus Amygdalus Dulcis (Sweet Almond) Oil, Potassium Cetyl Phosphate, Rhus Verniciflua Peel Wax, Parfum (Essential Oils), Hydrogenated Palm Glycerides, Magnesium Aluminum Silicate, Caramel, Xanthan Gum, Tocopherol, Linalool, CI 77499. Certified by BDIH. Vegan. Moreover, not only this mascara doesn’t have anything to do with its title “Extreme Volume”, but it is short-lasting as well. It looks good on my lashes for about three or four hours and then starts to crumble and stain the under-eye area. At first, I thought that maybe it was hot weather causing this, but nothing changes on cooler days. Have you tried Alterra mascaras? Previous Post noctu: Organic Cotton Nightwear + Giveaway!